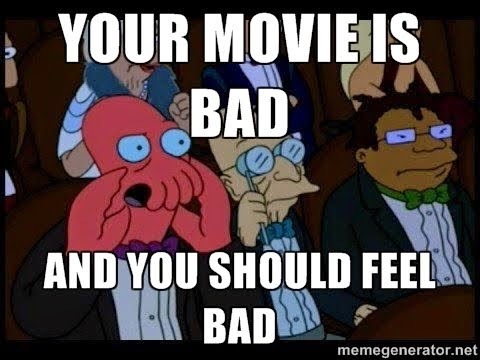 Your Movie is Bad and You Should Feel Bad: Everybody Loves Lists! I love your lists. You have heard some of mine. I will make some lists and put them here in the comment section. I need to think of some of them first. Who is HBC? John Malkovich? JOHN MALKOVICH???? **JOHN MALKOVICH**????? Whoops! I misspelled "Rutger Hauer". Sorry for the confusion. Does it reflect on my poor taste that the only list of the movies in which I have more than 1/5 hit rate is the one you so aptly named: The Most Incompetent Excuses for Movies That Hardly Deserve to be Called Movies....? Wait...you saw two of those? I love Demon Knight, love the ref, love Cube. The other two havent seen yet. The most impressive for me is how low he budget was for the cube, yet the movie was just as edfective if not more than those big budget Hollywood crap!!! !